What is the first book you remember loving? For me, it was a Golden Book that was read to me when I was very young — probably under 3 years old. My mother may have read it to me but the voice I remember is that of my paternal grandfather. I made him read it over and over again and I memorized it early on. So when he would read it and try to skip pages (and who could blame him — I’m sure it wasn’t that entrancing to an adult), I would correct him. Did I mention that I was an early talker? The story was about Mickey Mouse, Pluto, Goofy, and a villain named Peg-Leg Pete (who was a pirate) who attempted to steal a treasure chest full of jewels from the ship they were on. When I got older, I searched desperately for a copy of that book. I used to go to a lot of antiquarian book shows and haunt second-hand bookstores and I’d ask everywhere for the Peg-Leg Pete book. Nobody had it. Nobody had even heard of it, until I finally met a dealer who not only sold a lot of old Golden Books, she actually knew what was in them. Somewhat dryly, she informed me that I’d probably have more success if I asked for the correct title. Turns out it wasn’t called Peg-Leg Pete. 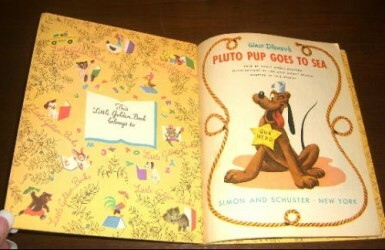 It was called Pluto Pup Goes to Sea. Awww, the Golden Books. I remember a bunch of those being passed down to me when I was little. Such fun books. I wish my older siblings took better care of them b/c by the time they got to me they were all yucky. I hope you’re having tons of fun with this read-a-thon adventure!!! HAPPY readings and GO TEAM WORDSWORTH!! !